Hypertension or high blood pressure is a chronic medical condition in which the blood pressure in the arteries is elevated. Blood pressure is typically recorded as two numbers, written as a ratio like this: 120/70 mm Hg. Read as “120 over 70 milli-meters of mercury”. Systolic – The top number, also the higher of the two numbers, measures the pressure in the arteries when the heart beats (when the heart muscle contracts). Diastolic – The bottom number, also the lower of the two numbers, measures the pressure in the arteries between heartbeats (when the heart muscle is resting between beats and refilling with blood). In Bikram’s first book, he has a section titled, “High Blood Pressure” on page 204. Here is an extract but please read the whole section as he also mentions Fixed Firm Pose and Bow Pose with timing of the postures. Bonnie Jones Reynolds & Bikram Choudhury. Bikram’s Beginning Yoga Class. Los Angeles: J.P. Tarcher (2000). Print. I checked Bikram’s second book, “Bikram Yoga” © 2007 and strangely, I could find no mention of hypertension or high blood pressure anywhere, not even in the posture guides of the above postures. Why did he leave this out when he made special mention of it in his first book? I read a bunch of yoga websites and the general consensus is to avoid yoga poses that position the head below heart level, especially when the practice or pose is vigorous. Instead, bring the chest parallel to the floor instead of bending forward at the hips to the point where your head drops below heart level. But in anything you read out there be mindful; there are contradictions on which poses to avoid and this does not refer specifically to the Bikram Yoga Beginning Series. If you have been recently diagnosed with hypertension and are starting or practicing Bikram Yoga, use the top-down approach with professional advice at the top. Read the section “High Blood Pressure” in Bikram’s first book, Bikram’s Beginning Yoga Class. Talk to the studio owner and remind the yoga teacher before each class until they get to know you. During class when the teacher says, “Push more, push harder”, he is NOT talking to you! Do your own research – get educated on your specific condition. Practice! The more you practice, the more you will understand how your body reacts and you can start to make decisions on how your practice evolves. My brother gifted me an old yoga manual from the Bihar School of Yoga; it refers to a publication, “Blood Pressure Management Through Yoga”. 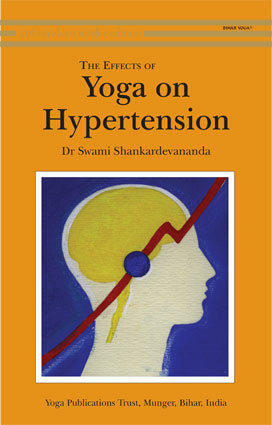 When I searched for the publication it appears to be superseded by “Effects of Yoga on Hypertension” by Dr. Swami Shankardevananda. Thanks for your comment Cardio Guy!